Amber and Rachel’s positions were supported in part by PLT Canada’s Green Jobs in Green Spaces program, funded by the Government of Canada’s Youth Employment Strategy. 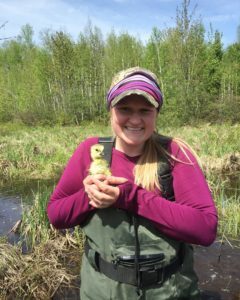 University of New Brunswick Master of Science in Forestry candidate Kelly McLean hired two PLT Canada wildlife technicians, Amber Frak and Rachel Moran. 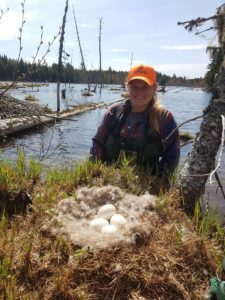 McLean is trying to determine the forest harvest operations effects on New Brunswick forests’ distribution of American black ducks. The ducks live in areas like shallow lakes, ponds, wetlands, and bays. Frak, a Chatham, ON local, completed a three-year Fish and Wildlife program at Fleming College. She’s now in her second year of biology at Trent University. This isn’t her first fieldwork experience. She’s worked as a tree planter in Northern Ontario, a maintenance student for Ontario Parks, a fisheries technician for the Ministry of Ontario, and a wildlife technician doing goose banding for the Ministry of Ontario. However, it is her first experience working in academia, and she’s found it to be very different from her government experiences. She said she’s learned more about Master’s projects now having worked alongside a faculty of forestry and environmental management MScF candidate. “My least favourite thing has probably been, for our brood surveys we’ve had to wake up extremely early in the morning, like 3:30,” she laughed. “My favourite thing is just being out and about in the field and seeing all different things around you, like you never really know what you’re going to see, and it’s cool seeing all the different species and all the wildlife. Originally, Frak wanted to become a veterinarian but was deterred by the competitiveness of the program. Her mom took her to Fleming College, and she knew it was the right fit for her. After her time at Trent, she’s going to try to go straight into the workforce, ideally in a government job. Find out more about the American black ducks here.